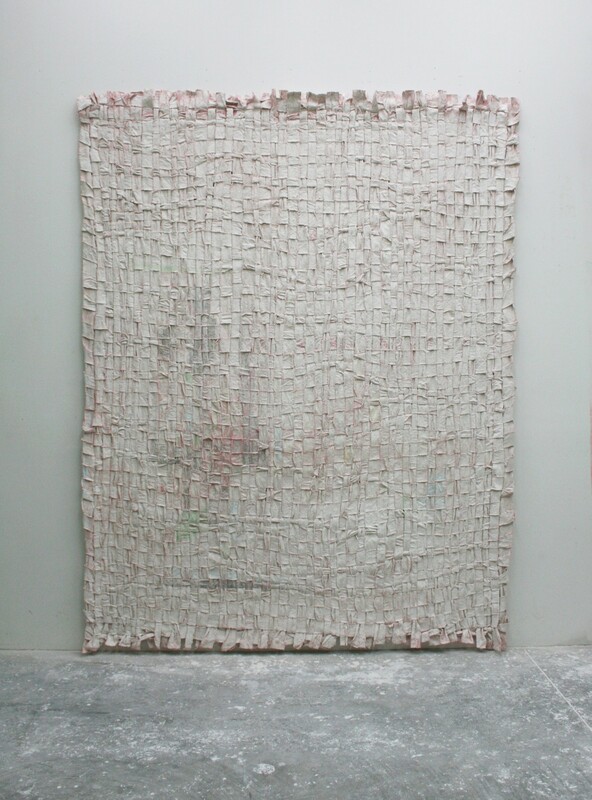 Jodie Carey, Untitled, 2015, pencil, dye, plaster, canvas, 269 x 210 cm. The Dallas Art Fair kicked off last night with throng of well-heeled would-be art buyers filling the hallways of the Fashion Industry Gallery. It is all a bit of an overwhelming affair. I went to the press preview earlier in the day, and it took a good 20-30 minutes to overcome the initial rush of oversaturation. At the crowded gala, F.I.G.’s narrow, low-ceilinged hallways can feel a little like a rat labyrinth, and I got turned around more than few times. It’s easy to deride the art fair experience, and yet by evening, champagne in hand, a mix of artists, collectors, dealers, museum folk, politicians, society gadflies, and the rest of Dallas’ cultural notables filing through F.I.G. the entire affair felt less like an artistic meat market and more like a huge, well-attended, high-spirited and high quality Design District art opening. “Lots of leather and zippers,” said one New York dealer of the Dallas crowd’s fashion sense. It was her first time to participate in the fair, and she said she brought some work with her that she thought would be best for Dallas tastes – the same stuff she brings to the Hamptons Art Fair. And yet, by the end of the night, it wasn’t the gooey, abstract “sweet stuff” paintings she had sold, but rather the more interesting, outsider-leaning drawings and paintings. That anecdote speaks to a broader learning curve that the city, the art fair, and the dealers who populate it have been traveling on over the past 7 years. I bumped into an elated Art Fair co-founder John Shugrue while leaving last night, and he spoke about the efficiency of the art unload – tons of art hauled off tractor trailers over the course of just over a day – and joked about the logistical headaches of the early years. Then there’s the dealer curve. Many of the best galleries continue to come back each year, a positive indication that they are moving work and find value in the connections they make while in Dallas. And their booths feel less full of the “stuff for Dallas.” It would seem that they have begun to realize that Dallas collectors don’t necessarily meet clichéd expectations of Dallas taste. There is a lot of art worth seeking out at this year’s Dallas Art Fair. Here are my highlights from the fair, which offer a very subjective and impulsive tour, not a ranking or a best-of, but just a rundown of what struck me as memorable, surprising, or worth noting. I’ve left off the local galleries and focused on the stuff we don’t get to see around here regularly. Harlan Levey Projects – Perhaps my favorite single gallery in the show. If all the Dallas Art Fair accomplishes for me this year is putting Cleveland-based artist TR Ericsson on my map, then I consider it a success. Ericsson’s work here included a dreamy blown up photograph of his mother in her youth, a black vinyl record continuing 20 tracks of conversations with his now-elderly mother, and a rack of zines containing reproduced copies of his grandfather’s notes and diaries. It is a kind of anthropological mining of nostalgia-inducing artifacts, work that locates personal history and individual identity in a liminal space between elusive meanings and fleeting emotion. Galerie Tanja Wagner – You can find work by Anabel Daou at Conduit’s space, but the text pieces at Galerie Tanja Wagner are particularly strong. Her delicate pieces incorporate text that reads like melodramatic love poetry which is materially incorporated into the architecture of wistful, evocative paper works. Washburn Galelry – Just stepping into Washburn’s booth feels like a throwback to Leo Castelli-era art dealing. Here you can ogle at early Pollocks and a particularly odd little early figurative Rothko. Highlights also include abstract works by venerable artists like Myron Stout. MKG127 – If I had to pick best in show, it would likely be the Toronto-based MKG127, which mixes high-minded conceptual text pieces with some fantastic zippy rabbit paintings, all playing through a dense layering of conceptual reference points and conceits. If there is a sense that Dallas tastes are maturing, the presence of this gallery is an indication. Raebervon Stenglin – Works by Jill Magid, Robert Kinmont, and surprisingly delicious little diminutive still lives by Ivan Seal round out a diverse booth that’s deep in quality. 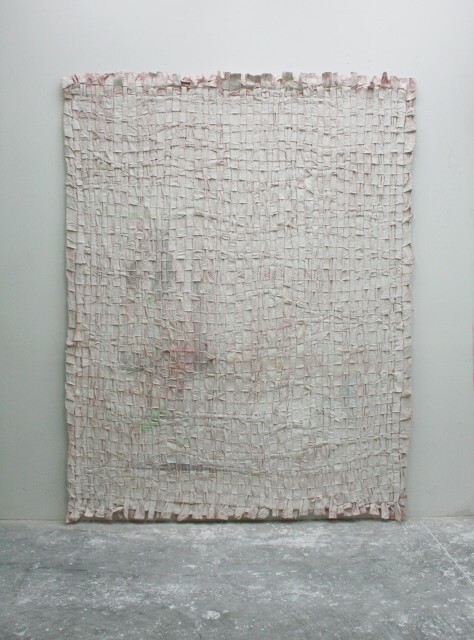 Derek Eller Gallery – Directly across from Barry Whistler’s booth, which is given over nearly entirely to Nathan Green’s boisterous, uplifting throw-back abstractions, the Los Angeles-based Derek Eller Gallery also dedicates its space to one artist, Despina Slokov. Slokov appropriates text from coding and digital culture and filters it through a richly expressive painting practice that incorporates text into gestural, street-leaning abstractions which recalling Cy Twombly and Basquiat alike. Ibid London and LA – Another strong space with a broad-range of artists. I particularly enjoyed stumbling upon David Ademo’s shelf of diminutive little sculptural objects. The Apartment – Swing through The Apartment if only to check out White Columns founder Matthew Higgs’ tongue-in-cheek conceptual pieces, an ongoing series of torn out and reframed images from books and book covers. He calls them “found conceptual,” or “found abstract” art, and they filter modernistic aesthetic tropes through a conceptual approach that culls references to Duchamp’s readymades, consumer mass production, media, and literature. Federica Schiavo Gallery – I had two “finds” at this year’s fair. I mentioned TR Ericsson at Harlan Levey. Rome-based Federica Schiavo provides the other one. Virtuosic ceramicist Francesco Ardini creates twisted worm-like bowl pieces and vase-like objects covered in nuclear-blue pustules, complex constructions that can look a bit too much like Jolly Rancher glass-man Dale Chihuly for my taste. But when Ardini takes his interest in the interconnection of ceramics and the domestic sphere and pushes it through digital appropriation — as he does with a wall piece consisting of bathroom-style tiles printed with “selfie” images plucked from the internet – Ardini invents an intriguing new approach to his medium, suggesting a conceptual resonance in his material that can push both sculpture and ceramics into new terrain. Only 29-years-old, It will be interesting to watch how the Italian artist’s career progresses.